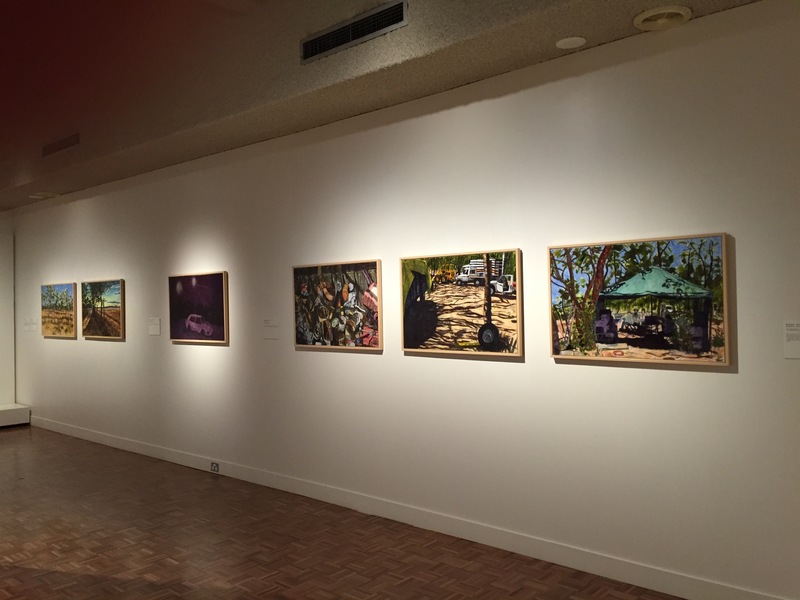 The touring exhibition ‘Bimblebox: art – science – nature’ has arrived in Rockhampton and it feels a little like a home-coming with Rocky being a service centre for central western Queensland and the closest the exhibition will come to Bimblebox itself. Some of us involved in the exhibition project, myself included, have family ties to Rockhampton which always intensifies the sense of place. It was great to be able to share the curator’s talk with artists Liz Mahood and Fiona MacDonald. Thanks so much to the gallery staff Sarah and Tom who installed the show – they brought some very nice touches to the exhibition design and layout, and to Director Tracy Cooper-Lavery for her support. 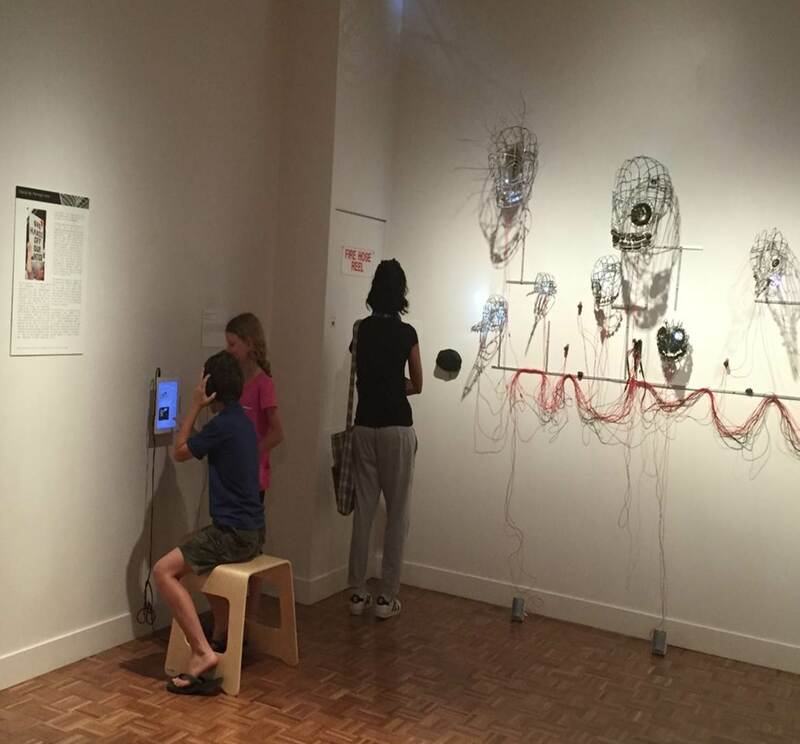 Artist Fiona MacDonald at left with visitors, including her family, at the Rockhampton Art Gallery. Fiona’s series of artwork prints ‘Mining the Galilee’ features in the background. 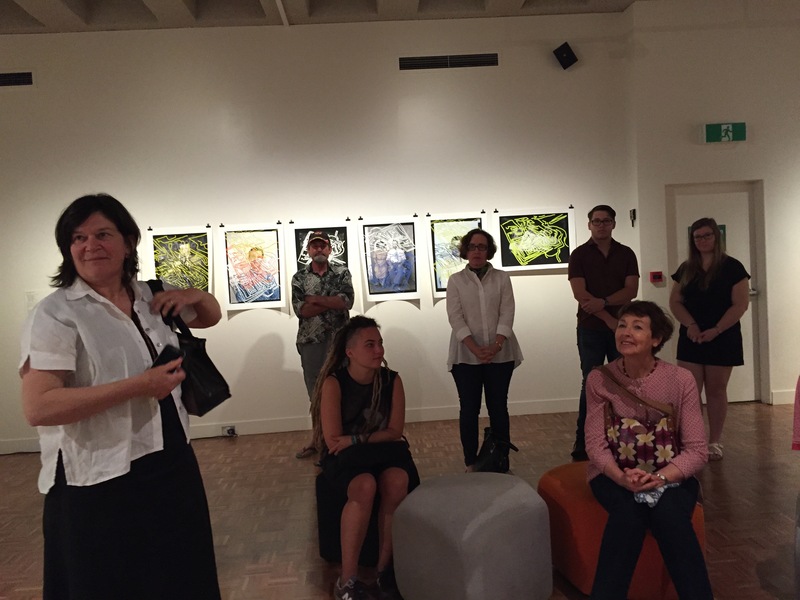 An audience gathered for the curator’s talk, including artist Liz Mahood on the far right with her daughter Kate standing beside. 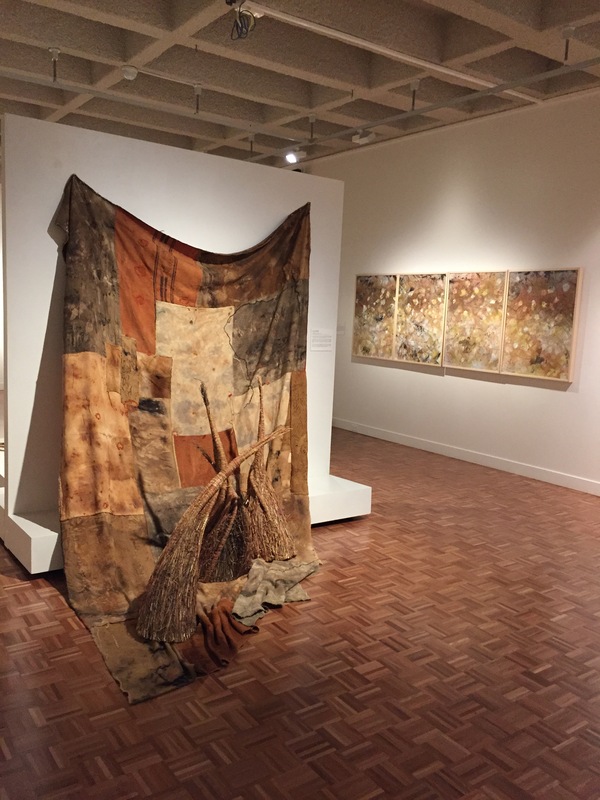 Jude Roberts’ artwork ‘Divine Message’ hangs above and the installation ‘Carbon Dating’ by artists Alison Clouston and Boyd features on the wall behind. Liz Mahood described making the four paneled artwork ‘The Invisible That Is’, depicted in the background, whilst at the artist camp at Bimblebox. After 3 days at camp, her mind was finally free of everyday concerns and her eyes began to see the landscape around her, and the work ‘made itself’. Jill Sampson’s wonderful installation in the foreground echoes the colours and textures of Liz’s paintings and, of course, the landscape of Bimblebox itself. Plenty to explore! 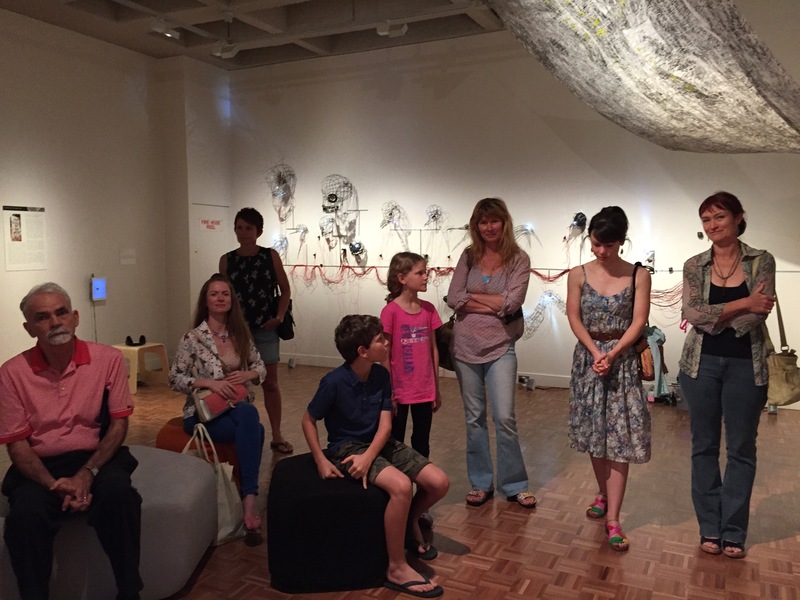 Curious youngsters listen to the musicians interpretive bird calls which comprise the sound track for the artwork ‘Coal Face’ by Alison Clouston & Boyd. Another work of theirs ‘Carbon Dating’, featured in this image, is equally intriguing. These paintings by Mick Pospischil began as charcoal drawings, made at the Bimblebox artist camp. They capture that first hand experience of this special place. Back in the studio, Mick transformed the drawings with layers of luminous oil painting. Another camp is soon to commence and another group of artists are soon to be inspired by this ancient, living, quintessential Australian landscape!